Today started with another wonderful breakfast at The Birds. Eggs, fruit, cereal, really good OJ and some other goodies. The kids were preparing to go to school with the local kids and Ilise, Karley and I were heading to Fira for the rest of the morning. 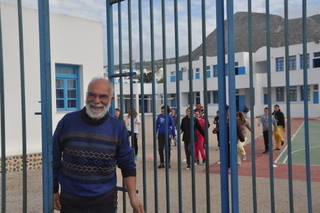 We were greeted at the school by the Headmaster, Rossetos’ cousin, who was so nice. He took the kids immediately and put them into a class upstairs at this simple little school with ocean views. We were told to come back around 1 PM as we left the school around 9:20 AM. It was off to Fira. Sampson, the personification of The Man in the Sea! 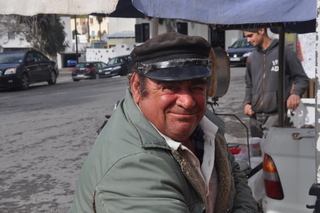 Our first stop was in the town square in Emborio where we ran into Sampson, who we met a few days earlier at Dimitri’s Tavern when we first drove there. Sampson is the perfect personification of “The Man in the Sea” as I would imagine him. 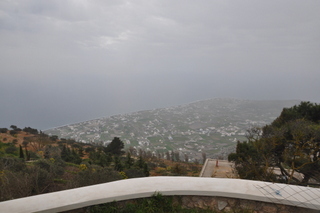 We purchased some oranges from Sampson and went on our way toward Fira. Before going to Fira we decided to try to get to the Monastery, which is located on the huge mountain at the top of the Island. 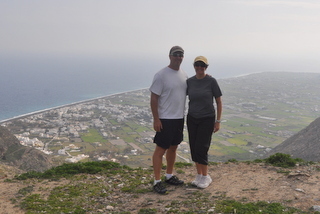 We drove through Pyrgos and up, up, and UP the mountain to the top. The road was very skinny and Ilise was holding onto the car door for dear life. When we got to the top we were literally in the clouds. We were about 2,000 feet above sea level within a few minutes. Karley even said that her ears were popping on the drive up. We tried to get into the Monastery but there wasn’t anyone around to let us in. We were told that periodically they will let tourists in to check it out, but we were not so lucky. 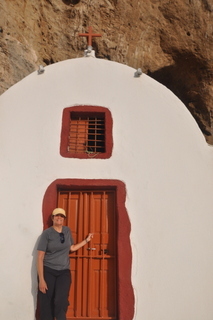 We headed down the mountain and on to Fira. Fira is the largest city on the island of Santorini and it is just beautiful. It sits high above the sea on a cliff with mostly white buildings and many blue roofs. The sight driving toward it is just breathtaking and the views of the surrounding countryside from the height of the city and amazing as well. 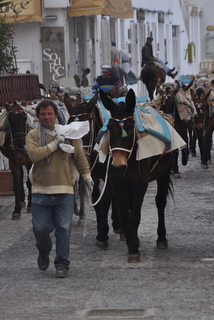 They regularly use donkeys to haul sacks up and down the mountain in the off season. During the height of the season those same donkeys are used to carry people up the more than 550 steps to get up from the sea. We walked around Fira, took lots of pictures and did some shopping. We had a few hours to kill before picking up the kids so we just enjoyed the views. 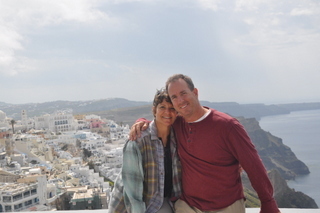 The day was nice, but a bit cool, and we checked out the trail from Fira to Oia, a hike we planned to do later in the week. It was a really nice few hours before heading back to get the kids. Upon our arrival back in Emborio the kids were totally engaged with their new friends. Noah was excited about the game of soccer he played in, as did Drew, and they were telling us about all the kids they had met that day. They were invited back for the next day, which is the beginning of the Independence Day holiday. The school was planning a show and they wanted us to come. We now had plans for the next morning! We returned home, ate a light lunch and the kids started on their homework as Ilise and I started on a hike up the mountain behind our apartment. On the road approaching the trail head we ran into 5 young Standford students that are staying in the apartment right next to ours. They were all exchange students living in Berlin on spring break for a week or so. They joined us for the hike to the top of the small mountain. We had a great conversation and I spent time with them the following evening to get insights into what to do in Berlin when we visit there in late May. The conversation was great and the view was amazing as well. Ilise and I stayed at the top of the mountain for a bit as the Stanford students decided to climb all the way up to the Monastery, which was another 45 minutes up the mountain. Ilise and I started talking to another couple that were up there taking pictures and it turns out that they are from San Diego. Kyle and his girlfriend, Lindsey, were on holiday and we started a very spirited conversation. It turns out that Kyle wants to be a motivational speaker and is currently working in his family business. We had an instant connection and upon departing we agreed to meet the following morning for a continued conversation, which we did. On the way back down the mountain we stopped at a small church built into the side of the mountain. That was a special moment and a special little place. The day ended with a few phone calls and a early night to bed. It was one of the more full days we have had in a while and makes me appreciate this journey more than I have to date. Each day I continue to get more and more relaxed and enjoy each moment as it comes. We are only two months into this journey and I feel my smile coming out and I feel a sense of gratitude that I have not felt in a very long time. We are so lucky to live where we live, have two healthy children, healthy parents and the freedom to take this trip. I look forward to dedicating the rest of my life to live with this much freedom and passion and joy. This entry was posted in Uncategorized, World Trip 2015.